Are you curious to explore the possibilities of an ever-changing world? Do you have an entrepreneurial streak and seek opportunities to make a difference? If this sounds like you, start talking with us today about our graduate program. We are now recruiting for our Canadian and UK graduate programmes. Click here to apply for our Toronto Graduate Program! Click here to apply for our London Graduate Programme! Click here to apply for our Sydney Graduate Programme! We are also currently recruiting for interns/ co-op students in London and Toronto. Please click here to apply for the internship in London and here for the co-op internship in Toronto. 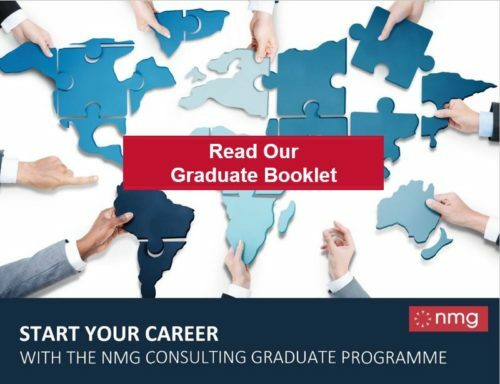 As part of our graduate program, you will have the opportunity to participate in international assignment and gain exposure to the different businesses and segments as well as to senior talent within NMG. You will obtain extensive market knowledge, along with experience in project planning and execution across a variety of client engagements. We are interested in meeting talented and driven graduates who are looking for more than just a place to work. We recognise that for an exceptional individual to grow, there needs to be sufficient challenge, reward and motivation. Our flat structure ensures you will have front line exposure; and our global focus provides fantastic opportunities for travel. We look for people with excellent analytical abilities, a demonstrated understanding of (and interest in) our target markets, and the ambition to shape the way our clients see the industry and their businesses. We have a strong emphasis on technical expertise: most of our consultants have professional qualifications in their chosen field, often obtained with the support of the company. In return, we offer our people the chance to work with leading financial institutions, to build real depth of understanding and expertise across markets, and to be part of a dynamic and diverse team environment whilst shaping your own Consulting career. For more information on what our graduate programme involves please click here. Our application process is fast and efficient. After submitting your CV, shortlisted candidates will have a initial 20 minute phone interview, and if successful, will be asked to come into one of our offices for a face to face interview. At the very last stage you may also be asked to complete a short online psychometric test.